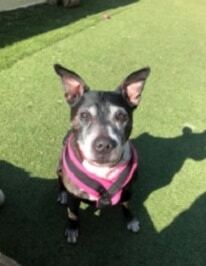 Angel is a 15-year-old tiny Staffy girl who is absolutely gorgeous and is the current office dog at Foal Farm Animal Rescue in Biggin Hill, Kent. She loves meeting and greeting the visitors there. 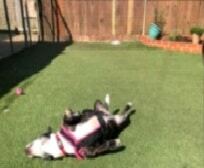 Angel is in rescue as her owner moved in with their partner, and even after such a large change at her age, Angel is still a very happy girl who is always pleased to see people. She amazes Foal Farm staff as she is full of life and really enjoys going out and about. Sweet Angel is often seen looking cosy, snuggled up in her blankets and duvet, but Foal Farm are desperate for her to have proper home comforts as soon as possible. 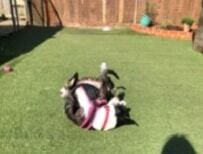 She can live with dogs and with cats, and she can go to an older family home. She enjoys walking with her doggy pals. Angel has no current medical issues and she is spayed. Could you offer this sweet old girl a happy home for the rest of her days? Please mention that you saw Angel on the Oldies Club website.